William Penn runners won three individual events to highlight the Delaware Valley Girls' Track and Field Coaches Association meet at Lehigh University. Juanita Broaddus recorded a solid win in the open 400 by posting a 57.4, more than a full second ahead of second-place finisher Jessica Starace of Archbishop Ryan (58.7). Other William Penn winners included Kandis Worthington (open 200, 26.5) and Christina Smith in the 55 hurdles (8.5), who just nipped Simon Gratz's Sabrina Shaw at the tape. 100-yard backstroke: Jessica Barnes, Bishop Shanahan. Barnes, a junior, won the PIAA Class AAA District 1 championship with a time of 59.73 seconds. She also placed 13th at states in 59.49. 100 breaststroke: Marissa Nilon, Unionville. Nilon, a junior, captured the PIAA Class AAA District 1 championship in 1 minute, 5.03 seconds. She also placed third at states in 1:04.0. 100 butterfly: Kelly Nelson, West Chester East. Nelson, a freshman, won the PIAA Class AAA state championship with a 56.44 clocking. She also placed second at districts in 56.83. 50 freestyle: Kelsey Morrissy, Hatboro-Horsham. Morrissy, a sophomore, won the PIAA Class AAA state title with a meet-record time of 23.15. She was also second at states in the 100 freestyle in 51.31. 100 freestyle: Meghan Peart, Germantown Academy. Peart, a senior headed to the University of Texas, won her fourth straight Eastern Interscholastic title in the event with a time of 51.75. She also earned her fourth straight 50 freestyle crown in 23.54. 200 freestyle: Tricia Harm, Council Rock. Harm, a senior who signed with the University of Georgia, gained the PIAA Class AAA state crown in 1:50.01. She also won the 200 individual medley title in 2:01.70. 500 freestyle: Kara Boland, Gwynedd-Mercy Academy. Boland, a senior who committed to the University of Tennessee, won the PIAA Class AA state championship with a meet and Penn State pool record of 4:47.36. She also placed second in the 200 freestyle in 1:51.19. 200 individual medley: Tracey Hemmerle, Souderton. Hemmerle, a senior, placed second at both the PIAA Class AAA state meet in 2:02.36 and the District 1 meet in 2:05.97. She is undecided on a college choice. 200 medley relay: West Chester East. The Vikings' squad of freshmen twins Caitlin Meehan and Erin Meehan, freshman Kelly Nelson and her senior sister Kathleen Nelson, placed second in the PIAA Class AAA state meet in 1:47.15. They won the District 1 title in 1:48.49. 200 freestyle relay: Germantown Academy. The Patriots' foursome of junior Meredith Cocco, sophomore Suzanne Rossi, junior Rachel Ahrenhold and senior Meghan Peart won the Eastern Interscholastic title in 1:37.5. 400 freestyle relay: Germantown Academy. The Patriots' quartet of juniors Meredith Cocco and Rachel Ahrenhold, sophomore Kirsten Jones and senior Meghan Peart claimed the Eastern Interscholastic crown in 3:29.8. Diving: Lisa Silvestri, Lower Moreland. Silvestri, a senior who selected Penn State, won her third straight PIAA Class AA state title with a score of 460.05. She placed second at districts to teammate Jessica Ranieri. 100-yard backstroke: Emily Watts, North Penn, freshman. 100 breaststroke: Caitlin Meehan, West Chester East, freshman. 100 butterfly: Lindsey Marck, Pennsbury, sophomore. 50 freestyle: Kristin Criner, Radnor, senior. 100 freestyle: Kristi Borkowski, Methacton, senior. 200 freestyle: Sharon Leary, Council Rock, sophomore. 500 freestyle: Kirsten Jones, Germantown Academy, sophomore. 200 individual medley: Annie Stein, Germantown Academy, junior. 200 medley relay: Council Rock (junior Lauren Prutow, sophomore Sharon Leary, senior Danielle Stocki, senior Tricia Harm). 200 freestyle relay: Gwynedd-Mercy Academy (junior Kourtney McMenamin, junior Sarah Jeffers, junior Diane Duncheskie, senior Kara Boland). 400 freestyle relay: Council Rock (sophomore Jackie Gribbin, sophomore Sarah Wagner, sophomore Sharon Leary, senior Tricia Harm). Diving: Jessica Ranieri, Lower Moreland, senior. Team scoring: William Penn 50, Erie McDowell 40, Merion Mercy 23. 60 meters: 1, Jakki Bailey, Kennett, 7.52 (tied meet record). 2, Juanita Broaddus, William Penn, 7.60. 3, Chioma Nwaneshuidu, Penn Wood, 7.75. 60 hurdles: 1, Courtney Clark, Norristown, 8.87. 2, Sheena Gordon, McDowell, 8.89. 3, Precious George, Academy Park, 9.03. 200: 1, Juanita Broaddus, William Penn, 24.02. 2, Juliette Poussot, Agnes Irwin, 24.35. 3, Courtney Clark, Norristown, 24.77. 400: 1, Tiffany Abney, Merion Mercy, 54.88. 2, Juanita Broaddus, William Penn, 55.06. 3, Nicole Leach, West Catholic, 55.58. 800: 1, Danielle Rodgers, Penn Wood, 2:13.68. 2, Kiarra McDonald, Merion Mercy, 2:15.27. 3, Meghan O'Neil, Spring-Ford, 2:17.71. 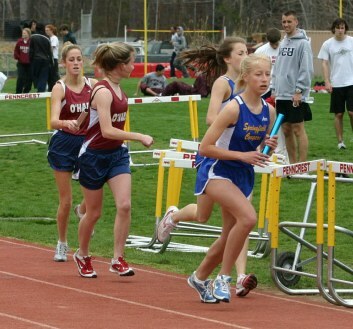 Mile: Amy Kelly, St. Hubert, 5:04.26. 2, Steph Madia, North Allegheny, 5:05.22. 3, Julia Pudlin, Baldwin, 5:06.06. 3,000: 1, Christine Taranto, West Allegheny, 10:04.25. 2, Erin Franklin, Wissahickon, 10:07.63. 3, Angie Saterstad, Hershey, 10:10.13. High jump: 1, Sheena Gordon, McDowell, 5-8. 2, Caitlin Redding, Penncrest, 5-6. 3, Erica Frazee, Shaler, 5-4. Archbishop Ryan, 17-101/2. , Kristin Malloy, Neshaminy, 17-31/2. 37-73/4. 3, Kerri Durica, West Mifflin, 36-10. 42-7. 3, Charity Paynes, Selinsgrove, 41-23/4. 4x200 relay: 1, Simon Gratz, 1:42.79. 2, Central, 1:43.38. 3, Upper Darby, 1:44.08. 4x400 relay: 1, William Penn, 3:53.05. 2, Chester, 3:57.65. 3, Pennsbury, 4:00.10. 4x800 relay: 1, Great Valley, 9:28.52. 2, Cardinal O'Hara, 9:30.55. 3, Hatboro-Horsham, 9:34.57. DELAWARE VALLEY GIRLS TRACK COACHES ASSN. 55 meter dash: 1, Chioma Nwaneshuidu, Penn Wood, 7.4. 2, Rachel Lewis, Harry S Truman, 7.5. 3, Candice Gale, Academy Park, 7.5. 55 hurdles: 1, Tyeshia Thomas, William Penn, 8.2. 2, Elisse Douglas, Episcopal Ac., 8.6. 3, Tina Griffin, Ridley, 8.9. 200: 1, Juanita Broaddus, William Penn, 25.3. 2, Nicolee Leach, West Catholic, 26.1. 3, Jennifer Lewis, Upper Dublin, 27.0. 300 yards: 1, Radia Baker, Upper Merion, 40.9. 2, Katie Quinn, Interboro, 41.3. 3, Nada Adbel-Magid, Hatboro-Horsham, 42.9. 400 meters: 1, Tiffany Bradley, West Catholic, 1:00.6. 2, Rachel Johnson, Girls High, 1:01.5. 3, Megan Hutchinson, Quakertown, 1:02.1. 600 yards: 1, Kandis Worthington, William Penn, 1:28.7. 2, Danielle Siebert, Central Bucks West, 1:32.4. 3, Colleen Dennis, Upper Merion, 1:33.1. 800 meters: 1, Ashley Ippolito, New Hope-Solebury, 2:20.0. 2, Tyeshia thomas, William Penn, 2:21.0. 3, Tynisha Gardner, Girls High, 2:27.9. 1,000 yards: 1, Laura Glace, Springfield (D), 3:04.7. 2, Brandy Gonzales, Hill School, 3:08.0. 3, Emily Israeli, Baldwin, 3:09.1. Mile: 1, Janine Ricci, Hatboro-Horsham, 5:23.1. 2, Joanna Marlow, New Hope-Solebury, 5:26.5. 3, Ann Churchville, Upper Merion, 5:31.1. 4x200 meter relay: 1, William Penn (Juanita Broaddus, Jeanette Rice, Kandis Worthington, Shantia Byrd), 1:45.0. 2, West Catholic, 1:45.3. 3, Upper Darby, 1:51.3. 4x400 relay: 1, William Tennent (Danielle Bourjollyu, Tina McDonald, Nicole Kulp, Michelle Bell), 4:21.9. 2, Central Bucks West, 4:23.6. 3, Quakertown, 4:23.6. Bensalem, 10:06.8. 3, Villa Joseph Marie, 10:10.8. Long jump: 1, Daniella Price, Chichester, 16-73/4. 2, Simmandi Lawrence, Upper Darby, 16-41/2. 3, Tina Griffin, Ridley, 16-31/4. Triple jump: 1, Angela Jones, West Philadelphia, 35-31/4. 2, Kristen Suhl, Upper Perkiomen, 34-21/4. 3, Jacqueline Inverso, Central Bucks East, 33-91/2. , Marci Parrish, Pennsbury, 33-101/2. Pole vault: 1, Kourtney Marquis, Pennsbury, 10-0. 2, Lauren Corse, Villa Maria, 8-6. 3, (tie) Ann Stout, Upper Dublin, and Nan Silkunas, Wissahickon, 8-0. 100, 200: Jannea Bridgeford, Upper Darby. 400: Lorraine Weldon, Lower Merion. 800, 1,600: Julie Opet, Radnor. 3,200: Stephanie Thomas, Springfield (D). 100 hurdles: Carrie Knipel, Penncrest. 300 hurdles: Leah Goodman, Conestoga. High jump: Kiley MacDonald, Upper Darby. Long jump: Sonya Mohamed, Conestoga. Triple jump: Brooke Lockley, Springfield (D). 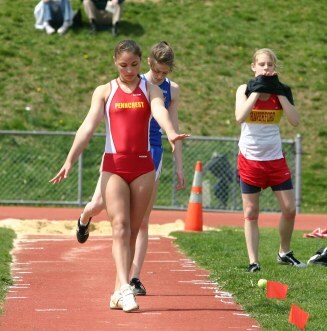 Shot put: Heather Allen, Haverford High. Discus: Katie Link, Upper Darby. Javelin: Kerri Smith, Haverford High. 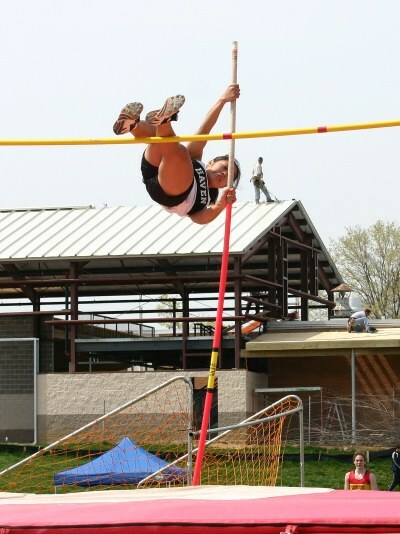 Pole vault: Sarah Berkowitz, Penncrest. 4x100 relay: Upper Darby (Marissa McGarrell, Jennifer Lewis, Simmandi Lawrence, Jannea Bridgeford). 4x400 relay: Upper Darby (Marissa McGarrell, Kiley MacDonald, Michelle Ezzie, Erin O'Doherty). 4x800 relay: Radnor (Colleen Flanagan, Casey Ostien, Meredith Cherwony, Juliet Opet). Cardinal O’Hara’s 4 x 800 relay team of Danielle Schopf, Megan Hallinan, Erin Kelly and Jen Kosloski took first place and Schopf finished third in the mile. 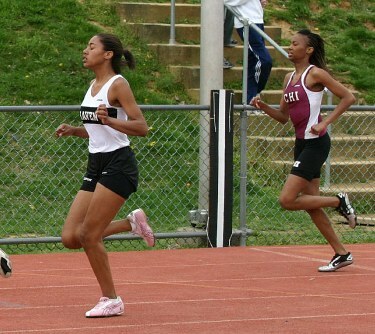 Freshman Pilar Batts of Archbishop Prendergast was the winner of the 200-meter dash, and junior Danielle Rodgers of Penn Wood won the 400-meter dash (57.3 seconds). Chioma Nwoneshuidu of Penn Wood was third in the 200. Upper Darby’s Erin O’Doherty took second place in the 600-meter dash, and the Royals’ Jennea Bridgeford was third in the 55-meter dash. Precious George of Academy Park was runnerup in the 55-meter hurdles. Amelia Koehler of Strath Haven took third place in the 800 and Garnet Valley’s Kim Gentry (1,000) and Caitlyn Redding of Penncrest (high jump) were fourth-place finishers.